Tuesday, September 5, 2017 4:00 PM Flushing High School AWAY 3 Holly High School HOME 5 Meet Recap Holly Varsity Boys defeated Flushing in a 5-3 win yesterday. The program’s record unbeaten streak is extended to 103 matches. The team takes on Fenton this Thursday. 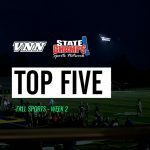 Bronchos News · Sep 6 Week 2’s Top 5 Plays – Presented by VNN x State Champs!